The Island of El Hierro has beautiful landscapes; its ground is fertile and counts on several mounts of pinewoods and giant beeches and “sabinas”, unique in the entire archipelago. In its summits there are more than a thousand volcanic craters. These “Lajiales” constitute a fantastic curiosity of the Island. The capital is Valverde, a calm villa, political and administrative centre of the island. In this town you will be able to visit the Ethnographic Center "Casa de Las Quinteras", where one can find an interesting ethnographic exhibition and a souvenir shop with local crafts. A must see place is the Church of the Conception, construction of the XVIII century located in front of the town hall. In the Island of El Hierro, distances are short, but its geography allows interesting excursions through its many mountains. We recommend setting aside a few days to get to know each of its beautiful corners. Another must see place is the Valle del Golfo. From the viewpoints of Peña and Jinama we will discover a magnificent view of the valley. This Gulf, of more than 14 km, goes from Roques de Salmor to the viewpoint in El Rincon, also called “Bascos”. The high escarpments reach up to a thousand meters, with vegetation-covered slopes and a number of white small villages along the way. In famous Roques de Salmor, to the northwest, lived a species of prehistoric lizard called Giant Lizard of Salmor, at the moment extinguished. The centre of Recovery of the giant Lizard of El Hierro can be visited in the town of Guinea along with one of the first eco-museums of Spain. The Gulf belongs to the Municipality of La Frontera, famous by its exquisite wines with denomination of origin and its banana and pineapple plantations. To the west we find El Sabinar and the hermitage of Nuestra Señora de Los Reyes (Our Lady of the kings), patron saint of the island. The south-western slope is an enormous extension dedicated to pastures, offering extensive views of the island; slopes with colours of fire and seeding of craters, descend quickly to the sea. This sea is called “Mar de las Calmas” (Sea of the Calms) because of the tranquillity of its waters. The Cala de Tacorón and the wharf of “El faro de Orchilla” are ideal places to enjoy a swim in its calm waters. If you visit this lighthouse you will be able to obtain from the tourism board a certificate accrediting being in the most western part of Spain. Sabinosa, with the Spa Hotel “Pozo de la Salud”, offers a resting place to those who would like to enjoy paradisiacal tranquillity and to benefit from the healing effects of its mineral-medicinal waters. The well from which this water is extracted remains open for all those who wish to taste it. To the east the region of El Pinar there is a vast forest of canarian pine that descends until the small valley of Las Playas where the Parador is located. In the south of the island there is the fishing town of La Restinga, excellent zone for fresh fish and diving. Near the colourful town of Tiñor, lived the Garoé or sacred tree of the “bimbaches”. In Tamaduste, to the northeast of the island, there is a small ria of calm open crystalline waters towards the sea. They form a concavity in the slope, which keeps it protected from the weathers and thus is always warm. It is a small tourist centre. Not far from here is the airport, and the small town of La Caleta. Near the port of La Estaca is the town of Timijiraque with its cove and small natural black sand beach. 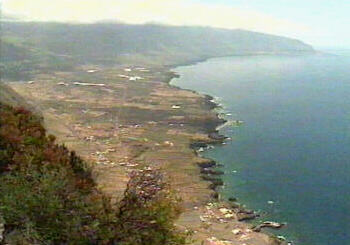 Continuing on the same road we will arrive at the zone of Las Playas in which bay is the peculiar Roque de Bonanza. We will complete the route of the northern zone with the visit to the colourful Pozo de Las Calcosas, Charco Manso, and the villages of El Mocanal, Érese and Guarazoca. In this last one we find the viewpoint of “El Roque” built by the canarian artist Cesar Manrique. With these wonderful landscaping contrasts you will surely keep a beautiful memory of this small beautiful island of El Hierro.